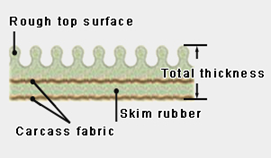 Rough Top Conveyor Belt – Standard Industrial Inc.
2 or 3 ply construction with cut edges and carcass of EP fabric. 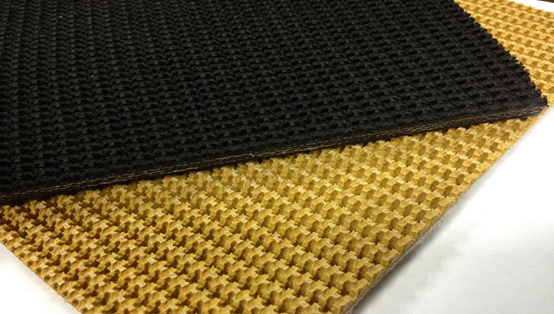 The surface texture resists the tendency for the material to roll back down the conveyor. The black top cover is recommended for utility type incline service while the tan cover is used for transporting packaged food products. Top cover is a full 1/8’’ thickness SBR and the black is protected by either a durable friction surface bottom or s synthetic bare back for slide bed application. The top cover is made of wear-resistant rubber with a non-slip surface. It has cushioning effect, mollifies and absorbs vibrations and impacts given on transported materials and simultaneously prevents slipping. Available with bottom cover or bare back for slider bed applications. Although it depends on the transported materials, transportation at inclination angles 25 ~ 30 is feasible. Rough top conveyor belt is used for transporting light weight goods, also suitable for fragile or deformed material, such as sacks, boxes and parcels, glass, on inclined surface at angles of maximal 35 degree .